CLOCK: Sweeping backwards! Skip first! Lead last! Scoreboard upside down!...The visiting' rink's from Hell, boys! (All out in sheer terror.) You're riskin' your immortal souls in a Black Bonspiel! Set in the town of Wildrose, AB, in the 1930s, The Black Bonspiel of Wullie MacCrimmon tells the story of a shoe repairman called Wullie who agrees to face the Devil in a curling match. If Wullie and his teammates win, they will be victorious in the MacDonald Brier, Canada's national curling championship. However, if they lose, Wullie will forfeit his soul—and be forced to play third on Devil's curling team in the Celestial Brier! Poster designed by Okanagan College Writing and Publishing student Briana Banfill. What could be more Canadian than W.O. Mitchell, a curling competition with the devil set in the Prairies, and curling stones that can be used in any season? This is what you can expect on the stage March 5th to 8th as the Okanagan College Red Dot Players present Mitchell’s comedy The Black Bonspiel of Wullie MacCrimmon at the Kelowna campus. This will be the theatre company’s fifth production. Based on the classic literary tale of Faust's deal with the devil, a curling match sets the stage for this humorous, clever and Canadianized version of the ultimate battle between good vs. evil. "One of the challenges with the script was to create an actual curling match on the stage," says the play’s director, Mike Minions, Okanagan College's Educational Technology Coordinator. "Using the big lathe in the College's carpentry shop we built some wooden curling rocks on roller bearings. They painted up pretty well and the actors have been working hard to learn to make the shots they need to for each end of the game." The audience will be transported to the fictional town of Wildrose, Alberta, in 1936 where protagonist Wullie, a shoe repairman, faces-off with the devil and his rink from Hell consisting of Judas Iscariot, Lucrezia Borgia, and none-other than the melancholic Macbeth in a curling match. The stakes are high: a win means Wullie will ultimately earn gold at the upcoming Brier Championship, but if he loses, he not only loses his immortal soul to the devil, but – even worse in his opinion— he will have to play on the devil’s team in the Celestial Brier, a curling match between Heaven and Hell. This two-act play delivers quirky characters, clever dialogue and a fond look at the obsession with curling so typical of a prairie town. Performances take place at the Kelowna campus theatre on March 5th, 6th, and 7th, at 7 p.m., with an additional matinee on Sunday, March 8th, at 2 p.m.
Tickets are $15 and are available at the Okanagan College Campus Store, Mosaic Books, and the door. 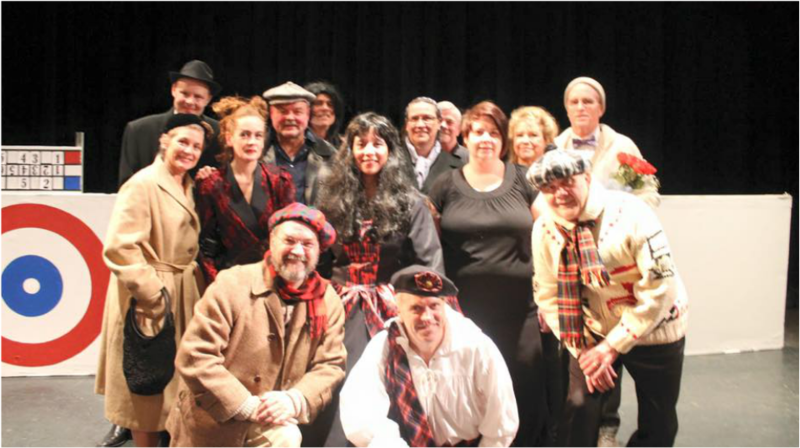 The Red Dot Players is a theatre troupe for Okanagan College students, alumni, and employees based on the Kelowna campus. Previous productions include The Beaux' Stratagem (2011), Blithe Spirit (2012), Les Belles-Soeurs (2013), and The Government Inspector (2014).